Non-student community members of the WMUA radio station have called for an investigation into the University of Massachusetts’ Chancellor and Vice Chancellor’s office in response to the University’s announcement of the radio station’s restructuring. Dunphy said that there has been an ongoing correspondence between Rosenberg and the community members of WMUA over this issue. Dunphy expressed concern over the timing of the announcement, a lack of leadership from UMass administration and for the direction of the station in the future. “There’s a lot of things here that need to be investigated,” she said. Yesterday, administrators at UMass announced that a large restructuring of WMUA would take place, limiting the programming hours of non-students to 24 hours a week and taking away the ability of non-students to vote on station matters and eliminating the current station manual. 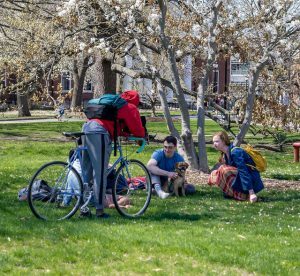 These changes are expected to go into effect at the beginning of the spring semester. At a Tuesday press conference, UMass Associate Chancellor Susan Pearson said that said an external review team had found that most college radio stations limited the broadcasting of non-students to 24 hours a week, in order to provide more educational opportunities about broadcasting to students. Community member and non-student DJ Al Sax said that the greater amount of non-student programming at WMUA has elevated the UMass radio station above most other college stations. “We are above average because of the fact that we have community hours,” Sax said. Sax disagreed with the viewpoint that the amount of non-student programming at WMUA, which has typically been more than 24 hours a week, closes opportunities for student education, saying that he always specified he would be willing to work with student DJs on his applications for programming slots. WMUA General Manager Andrew DesRochers said Tuesday that the high amount of broadcasting slots taken by community members made it difficult for students to become involved with WMUA, as new broadcasters would likely receive graveyard shifts after midnight. DesRochers said that limiting the hours of non-student programming could open up more reasonable shifts for students who want to join the station. Sax said that he felt the restructuring hurt the station by limiting the input and contributions of community members. While he said that some of the changes, such as the implementation of a full-time adviser for WMUA, have been advocated by community members for a long time, he thought that the lack of correspondence between the WMUA community members and the UMass Administration over the restructuring was problematic. Tensions between the WMUA student leadership and community members of the station have risen since Max Shea, a non-student who hosted a show on WMUA, was removed from the radio station and ordered by the UMass Police Department not to enter the University grounds over concerns that he had violated the harassment policies of the station. However, Dunphy said she suspected that the restructuring of WMUA did not occur as a result of community members vocally opposing the behavior of WMUA student leadership and that the process was in motion before these disagreements began. The community members quoted in this piece are absolutely cracked. It is immoral to make students feel so unwelcome in a space that they pay for with students fees. Meanwhile, most of the people most vocally complaining about the students at the station say some of the most racist and offensive crap to ever go out over the airwaves, not to mention they are technically incapable when it comes to production. WMUA will continue to be a community resource to both its listeners and people who live in the Valley, but the people most vocal about students being “disrespectful” have been taking up airtime while not creating any value in terms of mentorship in the station, instead screaming in the faces of student employees for doing their jobs. UMass is protecting its students from bullies who have too much time on their hands to harass 19 year olds. I for one will be donating more next Fund Drive when I know I’m supporting innovative student programming and not a 60 year old white man doing racist accents on a 3 hour talk show. I noticed there seems to be some mis truths on both ends; not nessacarily outright lies but perhaps heated fabrications. Question: who is this 60 year old white man that does racist accents? I’ve never heard of a WMUA show; past or present, that did/does this. I personally wouldn’t care for it. But it seems mythic: playing into stereotypes of “those in power” (old white men) when I’m fairly certain there are NO ” old white men” in “power” at WMUA. Or was either. This again plays into mythic stereotypes about power structure. While my sympathy leans more towards the students; in seeing a more complicated picture. Frankly the idea any “old white men” own the station is frankly bizarre; before this decision the students had most of the power; now they have even more. The “old white men” stereotype seems to be directly playing into unconscious latent biases about power (i.e. The “power” that the community members were perceived to have, which was minimum prior to this decision). Again, who specifically is this mythical “old white man” who spouted racist steeotypes on his show? Remember, this is western mass… Perhaps the most liberal part of the most liberal state in the union. Yes.. All 50 states. While I’m not calling you a liar nor saying it’s not possible … I’ve never heard of such a thing from WMUA. Given the amount of misinformation (intended or unintended) on this ongoing fiasco; my gut tells me this “old white man” doeasnt in fact exist except inside your imagination. Again.. It is possible. But it IS western mass. One of the most liberal parts of the most liberal parts of the country. Lastly; if anyone of that kind made it on the air… They had to gain station clearance (i.e. Programming director) meaning while the dj is directly responsible for any violations…. The program director (and management in general) must take responsibility for allowing the dj on the air on the first place. They should have known this about them when they applied for a show when determining quality etc of said show. Lastly, you give off the impression that you witnesses it first hand (either in person or on radio). If on radio then the “60 year old man” contentention falls flat. Either way if you saw a problem with a dj you have a moral responsibility to report it; if you believe there was a problem. Did you? Or did you keep it to yourself… Only to gripe about it later online under a user name that could be a James Bond character (one letter like Q). Oh. This is news to me about people “screaming” at students. WMUA has had a good reputation for many years. Screaming is not something that will get you far in life. Most of these community members (not all) have been there for many years. This does not make them historically “in power”, in fact quite the contrary. Students have always had the power, they have even more then before. The idea they have the power is ludicrous; bizarre really. Lastly; most of the community members are former Umass students. With a year or two, most of these students themselves be “former students” … Meaning community members. You may not believe in karma (or whatever you want to call it.. It goes by many names, “what goes around comes around” etc) but many of these students in 10-20 years time will get similar (or worse, hopefully not) from early 20 year olds… And they’ll wonder wtf?! Karma is essentially (more or less) the sting of recognition when someone does onto you, as you did onto them. The community never had any issues with the students; again most I them are former Umass students themselves. They love WMUA and umass. They were all students themselves. They know a liar when they see one. Every class /job etc has one. To better relations. But honestly if people cannot prove their statements (and mind you this part isn’t a threat so much as a repeat of what uve read written elsewhere) making things up about someone is slander; which is a crime. So you need to back it up; however if you state a specific person and can’t back it up with evidence it IS slander. Hopefully this station will get back to its feet again. It had a LOT going for it. WMUA was a loose cannon. The “60-year-old white men” were the ones showing up on Sunday afternoons and questioning authority. The University of Massachusetts is now UMass, Inc. The corporate model demands autocratic control of the company’s message. The cartoon Minuteman logo personified the message UMass, Inc. wants to send: A banal Disney/Madison Avenue soulless thing with a big stupid grin. That’s the uniform soma of Corporate America that distracts the little sheep from whirring blades in the abattoir. The sheep of WMUA are the those duped kids quoted and photoed in the papers last week. They think they got what they wanted. They wanted a student playground free from those graying goats coming around with their weirdo music and their outdated notions of civil liberties and free speech. Let them bask in the glow of a hard-won victory for a semester or two. The victory shall be short-lived and hollow. When these students look back in five years with 2020 hindsight, they will realize they got played like a two-dollar Stradivarius. WMUA as “student radio” will be past tense. The WMUA call letters and the 91.1 frequency might still exist, but an outside entity will control WMUA and its programming. This entity, which shall go unnamed, will allow students internships, but no more laughing and no more fun. Student opinions and student tastes won’t survive the next pentad any more than community opinions and tastes survived the past eight months.